About a year ago, we reviewed a math drill game called Math Rider. This math game was designed to help kids to enjoy basic math fact practice. The program has been updated a couple of times, I believe, since I reviewed it last year, and I have to say that we liked it more this time-- though I'm not exactly sure why. The basic idea with Math Rider is that you have a series of quests to go on. Your horse rides along, jumping hurdles based on whether or not you correctly answer the math problems. You choose a single operation (addition, subtraction, multiplication, division) and there are three main levels within that operation. Easy uses the facts from 0-5. Medium has you working with the facts from 0-10. Advanced drills the facts from 0-12. There is also a master level, which you cannot access until you accomplish the earlier quests with high accuracy. One of the things that has changed in the newer versions is that when you start a new rider, the buttons are highlighted to help you more easily get started... so the "new quest" button flashes subtly the first time you log in, for instance, making it just that much more intuitive to "just do it" instead of having to find help files to tell you how to get things going. Another new feature is the ability to change passwords and to delete a rider. Love that. The quests are read aloud. I know I mentioned this last year as well, but it is so nice to see a math program that doesn't assume a child is reading at (or usually above) their math level. I have two struggling readers, and they get really frustrated when required to do a lot of far above their level reading in order to work some math problems. You have a choice when you set it up of using either American English or British English. Naturally, my big boys wanted British English. They think it is fun, and that definitely works for me. The reporting is fabulous. You can get great basic information at a glance, and you can get a lot of detail if you want it. I am incredibly impressed with the reporting. The storyline for a set of quests is cute without distracting you from the math practice. You can watch the progress you are making through a quest map. And it is NOT online. You need internet to download it. You need internet to register it that first time. You need internet to access the web-based help. And it checks for updates, and lets you know if any are available (which you would obviously need internet to get). But the game itself is playable whether you are hooked up online or not. Another huge one... it is available for Mac or PC. Before I talk about the cons, and about my kids' experiences and opinions, let me point out that this is intended for kids ages 6-12. My kids are Trina (nearly 6, with a "good grasp of addition concepts" so while outside the age range, she still does fit their description of who this is for), Richard (7), Thomas (11), William (13, so older than the target age by a couple of months) and Connor (14, and definitely older than the target age). For Richard and Trina, this has been great. They are only working within the addition set of quests, and they both enjoy it. 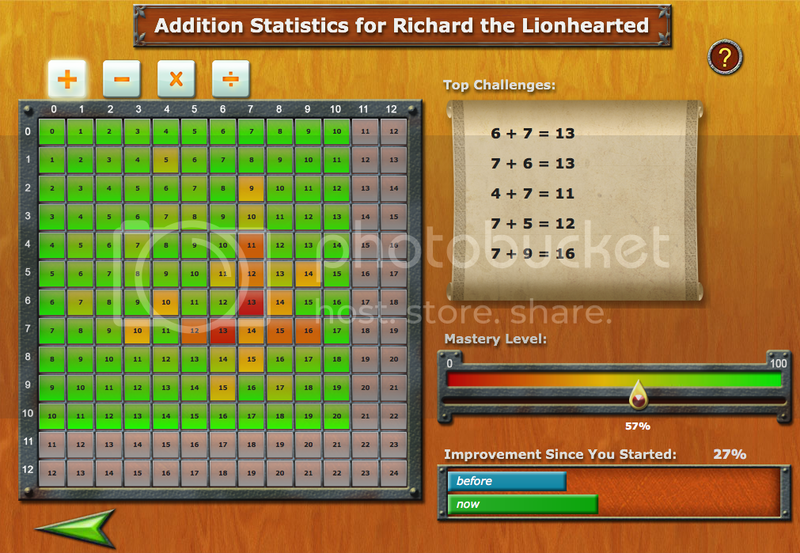 Richard said, "It's definitely a fun way of learning math. I like it." My older boys don't mind doing it. But. But they are very frustrated by the fact that the addition quests are *exactly* the same as the subtraction quests, which are *exactly* the same as the multiplication quests, which are *exactly* the same as the division quests. Obviously, the problems are different. 2x0 instead of 2+0. And when you get a little flower or flag or whatever, it is placed in a different spot. But the story is identical. "Couldn't it be that your twin sister is sick instead of your mother? Or your baby brother? Or your grandmother? Just something a teeny tiny bit different???" The master quest does differ a bit more, but I am the only one who has done any of those. Overall, with some of the little changes to the program, we were far happier using Math Rider this time. And for $37 (the price goes up to $47 next week, I hear) it is something we are considering. This is good for multiple users (the FAQ page says up to 8, though we have 9 currently). You can install this on up to three different computers in your home, which is not something we've done. Disclaimer: As part of the TOS Homeschool Review Crew, I did receive a fully functional but limited time trial of this program for the purposes of a review. All opinions are my own. For more about my take on reviews, visit my blog post here.